Car rides made easier with the Mifold Grab and Go Booster Seat! I've had a kid in a car seat or booster seat for the past 12 years; we've seen all kinds. They all had things in common besides keeping our babies safe; they were bulky, heavy and mostly awkward. 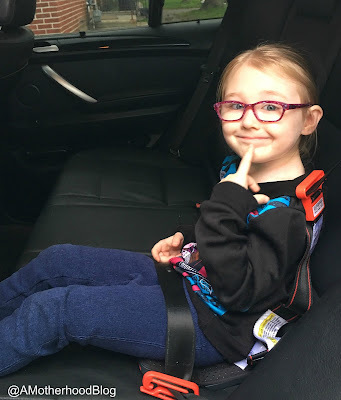 We've been talking about switching Miss M's current bulky car seat she's been using to a booster seat for the summer. We wanted something smaller but still safe for her age/size. We wanted a reliable, safe and simple booster; something that could grow with her and go with us. 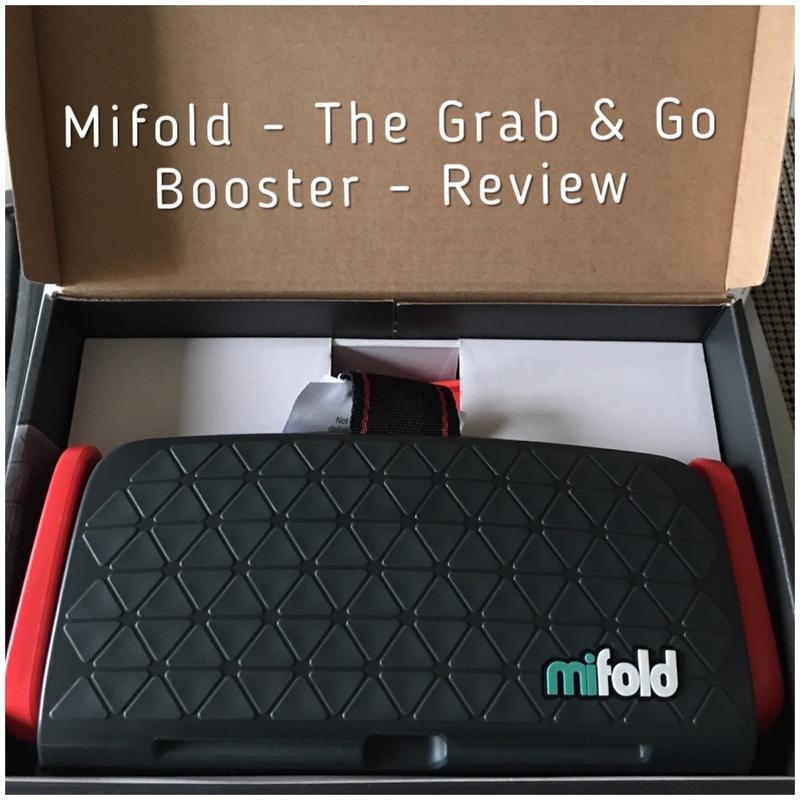 We were recently introduced to the Mifold Grab and Go Booster; it brings booster seats to a whole new level! 10X smaller than your average booster seat, just as safe! I'm amazed at the size, it fits in my bag! How can a booster seat that small be safe? Like all car seats and booster seats, Mifold passed Canadian standards and also has guidelines like the others. It's made for children aged 4+/40-100lbs/40"-57". How does it work compared to a regular booster? 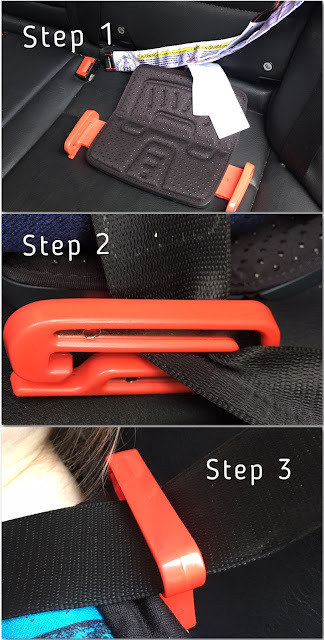 A regular booster lifts the child up to the seatbelt where Mifold holds the seatbelt down to the child. When I first took the Mifold out of the box I wondered "that's it? "; it's super compact! It comes in a variety of colours, too! We chose the slate grey one. Is your daughter the right size for it? Yes, my daughter does meet the recommended age, height and weight for this booster. Always check the guidelines of the booster or car seat to make sure its suitable for your family before you purchase. - Select the width setting for your child; small, medium or large. Place flat on the vehicle seat against the seat back. Sit child in Mifold with bottom and back against the seat. - Feed lap belt through the guides and fasten. Pull shoulder belt to snugly adjust lap belt low on hips and into thighs. - Attach the Mifold shoulder clip to the vehicle shoulder belt and adjust so the seat belt is snug. It's easy enough for an older child to do on their own; with a little practice! When clipped in she can move side to side a little bit but she can’t lean forward, it didn’t slide off or become loose. I am overly pleased with the Mifold for its functionality, size and cost (under $100!). I would recommend this seat for anyone looking for that perfect on-the-go, easy-to-use booster seat! You can find Mifold Grab and Go Booster seats at Canadian Tire or on the Mifold website! Don’t forget to like the Mifold Canada Facebook page for the latest updates! Enter using the ballot below for your chance to win a Mifold Grab and Go Booster (winners choice colour)! Please see blog disclosure page for more info about giveaways. Discloser: Posted on behalf of Mifold Canada. Complementary product received for review purposes. Opinions and comments on this blog are those of the author. This would be so awesome to have for when I have my granddaughter, and I don't have to worry about dragging out the way to big car seat and putting it in for a trip to the park, I love this!! I would take in on our trip to the East Coast! We're renting a car so this would be perfect! I would take it on our trips to the park this summer! I would take it on one of our trips to the beach this summer. I need one of these! I would take it to the zoo, the park, the beach and to visit grandma. My oldest is spending a week st grandma's thus summer. This would be so great to have. Thanks for the chance! We would go to visit the grandparents! I would use it to visit my grandparents. If i won this Mifold would go on a road trip across Newfoundand this summer. I would use this for my nephew when we;d go to parks or camping. I would take it on my road trips this summer. I would go to Great Wolf Lodge in Niagara Falls with my family! This seat would be great for our daughter and son in law who are always on the go with our grandchildren. They have 2 vehicles plus we often take the kids so this would be great. We go on tons of day trips all summer and two longer vacations. I would go to Niagara Falls with my little cousins. We'd use it on our camping trips to free up some space in our car! This would be great when traveling in taxis around town. what a great product. great for when you need space saving when packing the car full to the cottage. great for grandparents to have!! We would go lots of places with Mifold this summer - Whistler and other local mountains for day hikes; camping; Grandma and Grandpa's house; Othello Tunnels; local parks and swimming pools... Would really be handy!! I would go to Banff, Lake Louise and Jasper and everywhere! Thanks! We would take the mifold with us to Cuba this summer!! My niece would be using it to visit me! We would go everywhere as we do not have any seats right now, Mifold would be very helpful this summer for my little man. We would go and visit the grandparents! The Mifold would be perfect. this would be great for the trips to the ball diamond. This would be great for when we take the grandkids to baseball, skating, hockey etc! I'd take mifold to Drumheller to see the dinosaur bones. This would be fantastic for when we fly to visit family this summer rather than taking a full seat. The mifold would be perfect to bring on a vacation! So compact, I wouldn't have to worry about dragging a traditional car seat with me. The mifold is perfect for my daughter to take on their trip to Vancouver, they'll need one for my grandson. This would be a great travel car seat. And perfect for our upcoming Asia trip in the summer. This would be a great travel car seat. And perfect timing for our upcoming Asia trip in the summer. No more lugging heavy car seat around. No more lugging for our upcoming Asia trip. Splashing fun: Calypso Water Park Giveaway! Magic of Gazillion Bubbles + a giveaway!